Power of a Family: Give 'em a Hand! At a Power of Moms Retreat a couple of years ago, a darling mom named Heather told me how she gives her children "hands" (literally). She bought some paper hand cut-outs at the Dollar store, and whenever one of her children did something to exemplify one of their five family rules (like peace, respect, etc. ), she would write it on one of the hands--and then post it on a wall in their kitchen. My children will do ANYTHING for a hand, she told me. So I tried it with my children, and it worked like a charm. They wanted to be good and to receive my praise. They were nicer to each other. They went the extra mile. They helped around the house without being asked. But then I got distracted and stopped doing the hands for awhile--even though my children would periodically ask, "Mom, can I get a hand for that?" I would always say, "Oh yes--I'll make you a hand. I just need to find some of those pre-cut ones, or I can trace your hand and cut one out of construction paper. But absolutely yes! You deserve a hand." But then I kept forgetting. You can see how he wrote adjectives on each finger to describe himself: smart, nice, caring, loving (and a cute smiley face). 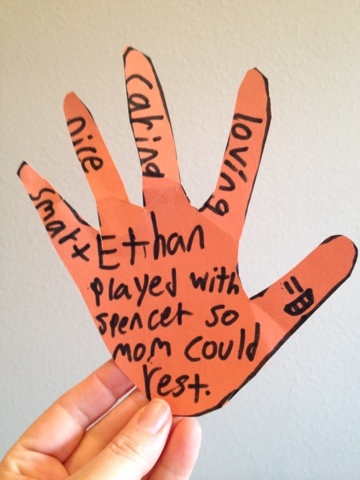 Then in the center, he wrote, "Ethan played with Spencer so mom could rest." Seeing "a hand" with my nine-year-old's handwriting on it really touched my heart. Part of me feels badly that I took so long to make one for him. But the other part of me loves to see him identifying the character traits that he is developing as he does good things in our home. 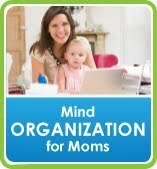 I think I'm like most women in that I want to be a really good mom. 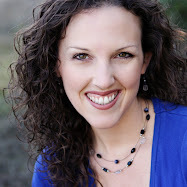 My husband tells me I'm too hard on myself and that I can't expect to meet the impossible expectations I set as the standard. And sometimes when I go to bed at night, my stomach is in knots because I wonder if I'm living up to what I know I can be. Do you ever feel that way? I AM going to work on making these hands a little more often. Once in awhile the children can make their own (because I think this is far cuter than what I can make). But little things like this are what my children will remember. And paying attention to the sweet things they do is going to help me love them all the more. Maybe I'll even make myself a hand and tape it to my bathroom mirror when I do something nice. This was just a sweet idea I wanted to share. Join Us for Date Night! L.A. Retreat Registration is OPEN!